Misaki, a 25-year-old woman who is soon to be married, finds an old photo taken at Tokyo Station and an old, broken pocket watch from her late father. Her father worked at Tokyo Station during his life and was a very strict man in her memory, but she saw his smile from the old photo that she's never seen before. Misaki, in attempt to have the old pocket watch repaired, discovers that a watch store existed in Tokyo Station in the past. Toki wa Meguru was created in celebration of the 100th anniversary of Tokyo Station. The goal of the short anime is to show the history of the station through animation and music. I'm going to preface this review by saying "It's 5 minutes, give it a shot." This will contain as minimal of spoilers as possible - it IS only 5 minutes. There really isn't much to say about the story, as it is 5 minutes. HOWEVER, given that, the short works with this time constraint very well through its introduction of back-story through both dialogue and flashback snapshots. Despite the cliche story and associated elements - in this case, the fate of our protagonist's father, the journey by train, the emotional catharsis through meeting the watchmaker - the emotions built up cannot be disregarded. 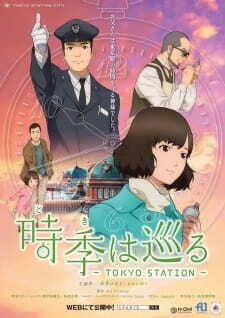 The short exceeds its original purpose of commemorating Tokyo Station's 100th anniversary, providing a short and sweet story of a daughter discovering her father. Oh, and keep in touch with your parents. Ow, my feels. A-1 Pictures does a GREAT job, as usual of their works. I may be at fault for overrating their work, but the short was visually captivating. Despite the entire short consisting of what is essentially a pop song sandwiched by a short string/piano instrumentals at the beginning and end, it works well. What really caught me was when the strings came back in right following the pause in the song, when the daughter reveals that she's getting married. The piano dying out right when our MC begins crying was timed perfectly. I watched this without the voice acting as well and had just as good of a time as I did with the original. I really enjoyed this, and I think the fact that it can be appreciated even without the voice acting/narration shows how well done this short is. Its short length did not hinder it at all - the brief snapshots of the past really accentuated the seemingly cliche story. I love how the short can make the viewer ask themselves questions - for me, it was whether or not the timekeeper she chases in the station was her imagination or just a stranger. What's supposedly a kind of ad became a short that tugged on the heartstrings. It ain't a masterpiece, but it's really good. Well, it's 5 minutes, just watch it. It's a simple charming story about a girl with a watch from her grandpa. The art is absolutely stunning and the sound is great too. Although the story is nowhere near grand, it's neat and kinda makes you feel good. It was just 5 minutes and I went in annoyed by stuff that happened today, but left satisfied and happy. One last time, just watch it, it's neat. To quickly give one last impression and meet the word quota of the review I will summarise my scoring. It simply looked stunning, everything about it did, visually, one of the best anime ever created in my opinion. Gave off a neat atmosphere and was nice for the ears, the voices were also done really well. It did it's job perfectly but I ain't going to put it in my playlist. The story was neat but way too short to give a true opinion, so let's keep it at this. Somehow you get the feeling that you mildly know the girl even if it's only 5 minutes long, you also immediately understand the girl's emotions for some reason. So yeah, if they managed that in 5 minutes, a definite 9. Well, it was extremely enjoyable, for 5 minutes, if it would've been longer I could've given it a higher grade, but still it passed quite well. Well, there's just too little information, but the stuff we did get was 10 outta 10, so let's just give it a neat 7.